I’m not a big fan of sweets other than fruit, and I’m also not a huge blue cheese fan. But, the combination of sugar-coated almonds and blue cheese in this salad elevates both ingredients. It’s ridiculously good. I’ve been trying to really get into blue cheese for over a decade. Sometimes I enjoy it in a dish, and other times its power overwhelms the things it should compliment. So, I understand if you’re not a blue cheese fan and the combination doesn’t sound fantastic. But it is. Jedd wasn’t even indignant, although he was wary. However, the salad won us both over. The cheese and bacon are salty and they play off of the sweetness of the apples while the brown sugar-coated almonds and the tart vinaigrette bind it together perfectly. Another great thing about this salad is that it’s a show stopper without showing off. There’s just a few nuts and only about a tablespoon of cheese so the real star is the apples. First, though, lets make those delectable almonds, which kind of turned me into a candy-snacking fiend. Melt the butter over low heat and gradually add the sugar until it’s incorporated. 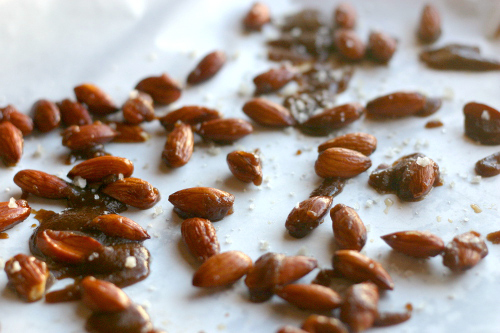 Add the almonds and stir well to coat. Gently pour the mixture out onto a sheet of parchment paper and sprinkle with sea salt. Let the almonds cool. Those that you don’t use in the salad can be stored in an air-tight container and snacked on at your leisure. Divide the ingredients between 2 plates and toss with your favorite vinaigrette. Here’s one of my favorites.